In essence, it is a 2 piece adapter, to fit many photographic or visual accessories to your telescope. 1) Part 'A' (#2958500A - 2" expanding ring) has a female 1.375"x24TPI thread which fits onto your MAK telescope, and a Std SCT 2"x24TPI thread on the opposing side. 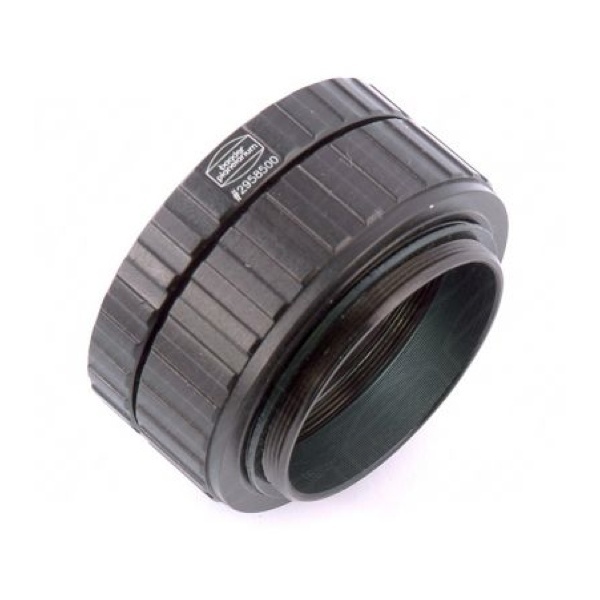 Part 'A' can be used by itself to thread SCT accessories to your MAK scope, this part also has internal 1.25" filter threads to allow a filter to be fitted inside the adapter. 2) Part 'B' (#2958500B - T-adapter Ultrashort) has a female SCT 2"x24TPI thread on one side and a standard male T / T2 thread on the other side, not usable on its own with a MAK threaded scope but can be used on its own to adapt your SCT scope to recieve T-2 accessories. When used with adapter 'A' above it converts your MAK telescopes 1.375"x24TPI rear cell into a standard T / T-2 thread and all Baaders extremely useful T-2 adapter system can then be attached. Please note: The design Specification on some of the Scopes listed have changed over time, and you must ensure that the thread sizes mentioned are applicable to your scope prior to purchasing this accessory.